How easy it would have been to miss the news that Matt Gonzalez, a former San Francisco County public defender, has agreed to serve as Ralph Nader's running mate on the Green Party ticket. Obviously, nobody - not even Gonzalez - is taking this candidacy seriously. But as a former public defender myself, I have a particular affection for the guy. He's a beer drinking poet who lived (and perhaps still lives) in a shared apartment in a middlin' part of SF. He is exactly the kind of person who should have no shot at getting elected to anything, and certainly has no business becoming a permanent Wikipedia trivia feature. Unlike Barack Obama, whom we're told hides a life-long laser-like ambition and drive, Matt Gonzalez seems the sort of fella who has been waiting for a bong hit all day. Is that what we need for a Veep? Perhaps not. And God knows we don't need Ralph Nader for anything other than entertainment at this point. 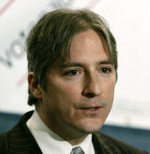 But for those of us brought up on Richard Linklater flicks, Matt Gonzalez seems like a candidate out of Hollywood. Or perhaps Texas. Wow. Mexican-American kid from Texas border town makes good, becomes Eagle Scout and president of his high school class, heads off to Columbia and then Stanford Law (made law review), actually WINS cases as a public defender, wins an election for Board of Supervisors (even if he "should have no shot at getting elected to anything"), loses only to Gavin Newsom in a mayoral election, decides to join Ralph Nader's ticket ... and he's been waiting for a bong hit all day? He's a slacker? Jason, everything you say is true AND he's a San Franciscan in the proudest 1980's tradition! If you heard an insult in my post, rest assured that it wasn't intended. Now that Dan's sought to downplay the inference that Jason reasonably drew from his original post (and that my first read of the post shared), it seems kind of beside the point to chime in, but I'll just say I lived in SF when Gonzalez was on the Board of Supervisors, and the guy was a very fine good government guy, certainly to the left of most everywhere else but right in the middle of SF's capaciously leftward bell curve. He was generally beloved in the public interest legal community, too. He was a mellow 1960s and 70s-era Ralph Nader type for the post-punk world, and very good at attracting young voters and getting them interested in government. He probably couldn't have been mayor, though, because I don't think his coalition could garner citywide support, especially against a well-funded candidate like Gavin Newsom. In the end the cultural trappings just clothed a very smart, engaged, and committed politician-lawyer. I don't think of him as a Medea Benjamin type, whose earlier public interest work might have been quite good, but she seems always to be running quixotic campaigns for whatever. In all, I find it rather disappointing that he's joined Nader here. A(nother) Nader campaign simply isn't a good vehicle for pushing political issues, and I'm not sure what the point of a third party campaign waged by a non-billionaire is these days otherwise.